Free Car and More: Read the Sticker! I finally found what I was looking for – the official EPA/DOT window cling for a 2012 Mitsubishi iMiEV. 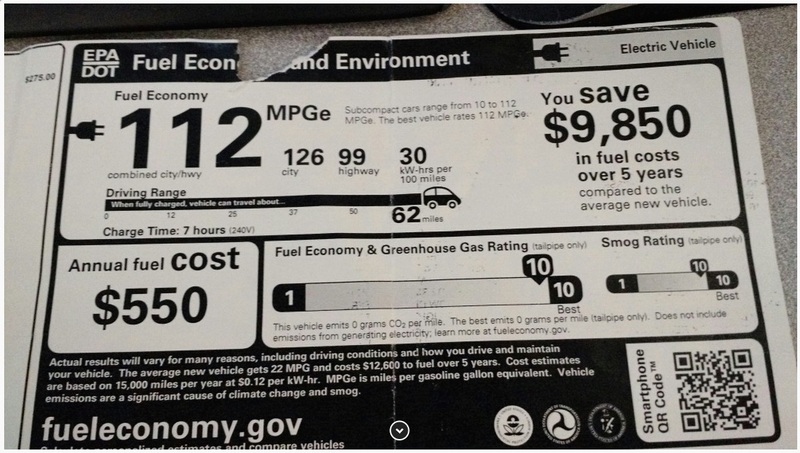 Since I bought my car used, it didn’t have the window sticker that describes the car’s fuel economy and several other important pieces of information. Recently, I found a photo of one from another car that was for sale. Take a look, there’s some very interesting stuff here. This is the highlights of what I noticed. Best fuel economy – period. The fine print reads “The best vehicle rates 112 MPGe”. In the large print, it lists this vehicle as 112 MPGe. Why doesn’t it just say THIS IS THE BEST MPG VEHICLE!!? As in, in 2012, you could NOT buy a MORE EFFICIENT car in the United States! It’s this! Pick this one! Top of the charts. The car rates 10 out of 10 on fuel economy, minimizing greenhouse gasses, and minimizing smog. Pays for itself! I bought this 2012 model year car, used, in 2015 for $7,000. The tag says that it will save $9,850 in fuel over five years vs. the average vehicle. Less than five years from now, my car will have literally paid for itself! Of course, this does depend on the cost of gasoline, which is why I am tracking my odometer, cost of electricity, and average gasoline cost. That way, I will be able to calculate the actual date that my car pays for itself, not just an “on average” guess based on stock numbers. Energy sources still matter. The fine print makes passing reference to where energy comes from. “Does not include emissions from generating electricity.” Traditional energy production does create pollution and CO2 production (although LESS than what a gas car would!) However, using electricity is the easiest way to switch to a renewable/sustainable energy source. I already purchase renewably-produced electricity through my power provider, and I have a small solar panel. I’m actively getting ready to install a large solar array. Once that’s installed, I will be able to create enough energy to simultaneously charge my car and power my entire house. After that, I will literally Drive for Free, Forever. Emissions are bad! Notice the grim warning of “Vehicle emissions are a SIGNIFICANT cause of climate change and smog.” It reminds me of the warnings on packs of cigarettes. Most people finally agree that smoking is bad. Glad to see warnings on car as well. Who’s the competition? Perhaps the oddest piece of information on this form is about the other cars in the same category. “Subcompact cars range from 10 to 112 MPGe.” What subcompact car gets TEN MILES PER GALLON!? And who would drive it!? Yipes! The tag also points out that the AVERAGE car in 2012 only got 22 MPG. I think we can do better than that, America! Well, those are the main things that jumped out at me. How about you? Perhaps you would love a super-efficient car that can also run on renewable power, but the Mitsubishi iMiEV just isn’t the one for you. That’s fine, there’s LOTS of other great vehicles with plugs out there. In fact, even the efficiency of the car has already been surpassed. The 2014 BMW i3 gets the equivalent of 124 miles per gallon. Even a used Chevy Volt (which you can get GREAT deals on right now) gets the equivalent of almost 100 miles per gallon, and can do the average daily commute solely on electricity, but you can still take an out of town trip in the same car. Here’s the important thing. You could be saving $9,000 on fueling your next car. Just make sure you read the sticker. Yes, it’s possible to save a lot on fuel costs and other savings. I’ve written a fairly complete overview of EV ownership economics on my website. A big consideration is that the numbers worked very well when crude oil was $100+ per barrel and gasoline was $3+ per gallon. But as gasoline prices fall, the economic advantage shrinks. In the book I’m finishing on, the numbers I calculated show a cross-over point at under $1 per gallon. In some areas of the US, gasoline prices are near that level. 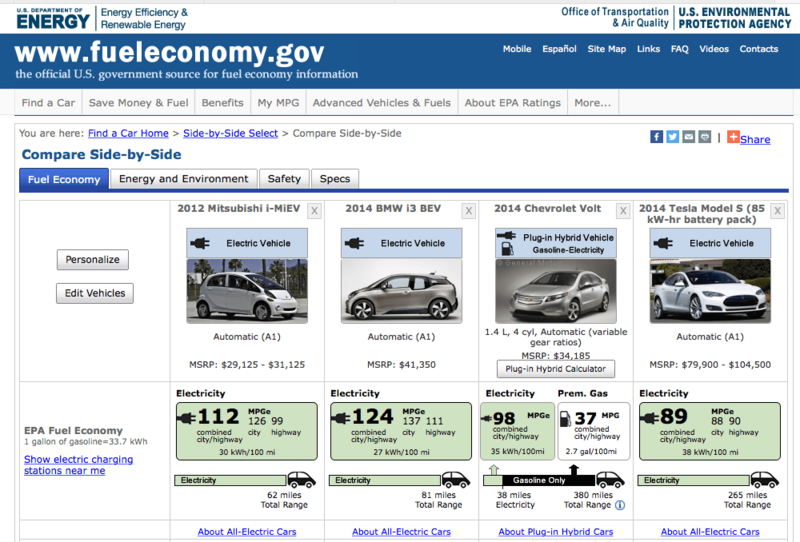 The 2012 fuel efficiency report is still on the web site at fuelefficiency.gov. It looks like the 10 mpg cars were Bentley Continental GTC and Bentley Continental Super Sports Convertible. Both 6.0L V12 engines in a sub-compact car. 10 mpg city. 8 mpg city on E85.